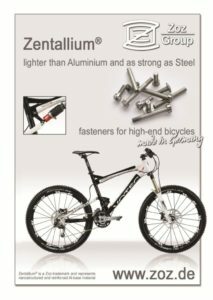 Zoz Light Weight Technology – Lighter than aluminium and as strong as steel! 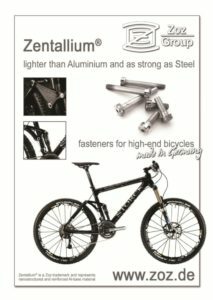 Zentallium® …lighter than aluminium and as strong as steel ! 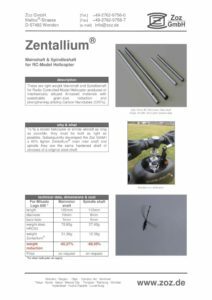 Zentallium® describes high-performance semi- finished products and parts from mechanically alloyed Al-base materials with lasting grain-size-reduction and reinforcement by Carbon Nanotubes (CNTs) for commercial application. 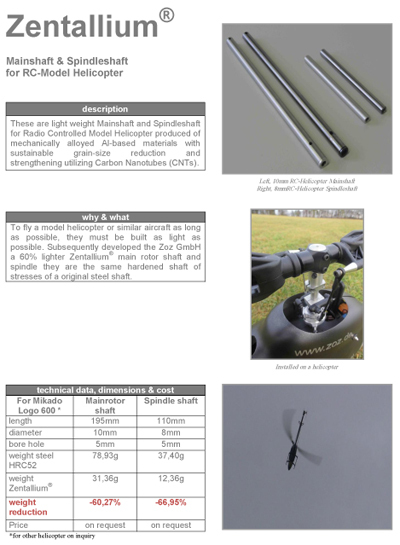 High-Tech-Transportation – no matter if by air, land or sea – demands highest requirements upon utilized materials. Whoever in transportation wants to save energy, emission and cost will initially try to reduce the mass to be moved as much as possible – a major objective therefore is lightweight. Light-weight material primarily should supply highest specific strength (relation: strength to density). 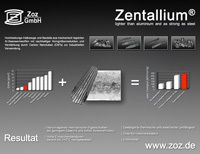 Additional requirements such as stiffness, temperature resistance, corrosion resistance, electrical and thermal conductivity and particularly cost efficiency do limit available materials significantly.Zentallium® represents a new mechanically alloyed and thus very powerful composite material that consists of an aluminum-based material and CNTs and is manufactured by powder metallurgy routeCNTs next to diamond belong to the most popular carbon modification and were discovered in 1990. The tremendous popularity is resulting particularly from the enormous mechanical strength. Thus, the modulus of elasticity compared to steel is 5 times and the tensile strength even 32 times higher. 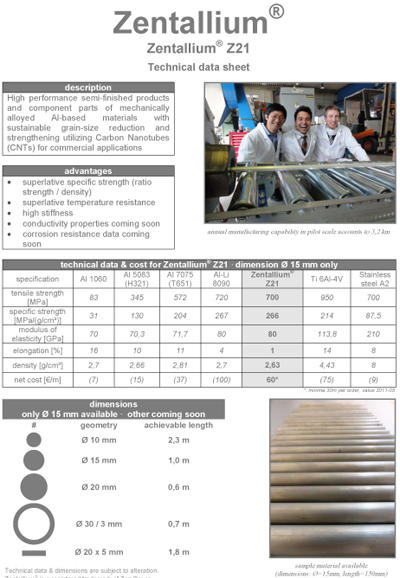 For decades one is trying to use these highly attractive mechanical properties in composites, especially since CNTs can be manufactured at an industrial scale at an affordable price. This however fails often at difficult dispersion / functionalization and the unsolved problems in forming a supporting structure of CNTs in a matrix, which could carry forces and transmit local stress. For the present knowledge therefore one has to refrain from the idea that CNTs could qualify for a primary hardening of a composite. 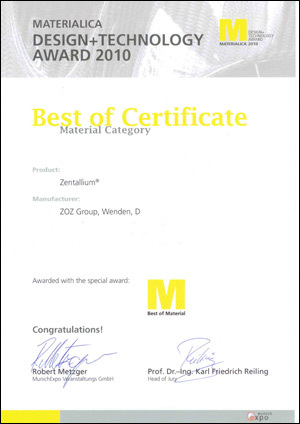 Zentallium® is characterized by a nanostructured Al-matrix microstructure with grain sizes well below 100 nm and benefits under the Hall-Petch relation of this enormous grain refinement. 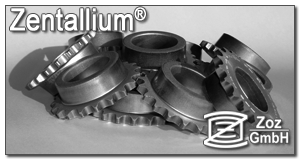 The processing is achieved by mechanical alloying in high-energy ball mills (Simoloyer®) where at permanent “dispersion, breaking and cold-welding,” a nanostructured matrix is adjusted where CNT agglomerates are in-situ resolved and embedded. This high kinetic processing technique has the advantage that in spite of the required high energy impact, the carbon modification CNT hardly is transformed into “useless graphite”. Furthermore a special clustering of CNTs must be adjusted since neither a fully dispersed nor an unchanged agglomerated CNT macrostructure do not provide the desired properties. 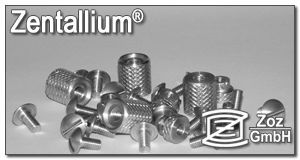 During the consolidation (processing of powder to semi-finished product) of the nanostructured material by extrusion or sintering, the high inner surface res. the highly supersaturated inner surface enthalpy would tend to grain growth towards a meta-stable structure. Along with the grain growth, the mechanical properties would be reduced again exactly this is prevented by the “incorporated” CNTs, thus ensuring a sustainable grain size reduction efficiently. In result e. g. exorbitantly high strength for an in this case Al-based material is achieved that even exceeds very expensive and highly reactive Al-Li systems. The CNTs however do not play a primary strength-enhancing but a secondary grain-size-control role. 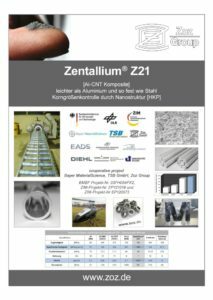 Zentallium® exceeds the strength of stainless steels and achieves the level of structural steels (in numbers: 700-1.000 MPa). In comparison to Al-based materials, the elastic modulus appears 20-30% higher. 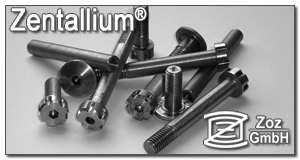 The CNTs stabilize this alloy system proven to 240° C which for commercial Al-alloys also represents an unmatched value. 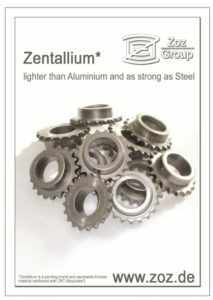 As for the status of today, the elongation for Zentallium® can be guaranteed at 1 % only which insofar cannot replace the used universal utilization e. g. of steel. The application also must be chosen properly. In the future we hope to further improve and modify this material so that we can reach expected 4-6 % elongation, which would expand the utilization capability accordingly. 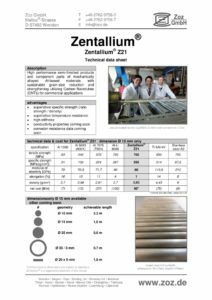 The potential of this alloy system is at the beginning of the development and far from being fully exploited however it is already apparent today, that the materials cost will have to be less than half of a conventional titanium alloy (see Data Sheet E-15 incl. cost/meter).